As we reflect upon 2018 and look to the future, we’d like to extend a huge thank you for entrusting us with your business. We hope you will take a moment to be reminded of our commitment to you and join our enthusiasm for the future as we reiterate why we’re here and where we’re headed. Great things are coming! InFocus was built and launched as a solution to multiple unaddressed problems we saw in A/E products at the time. Legacy ERP systems were clunky, unsupported, and overpriced with no attractive upgrade paths. Because the companies who made these products controlled the market, they consistently hiked prices with little to no product improvement while selling stories about the brilliance of their “next release” or “next try.” Sadly, many firms were forced to accept mediocrity at high prices because there existed few alternatives, especially for enterprise firms. Instead of being treated as valuable people doing valuable work, A/E firms were being treated as cash cows. We imagined a different world – one where instead of being herded around, A/E firms asked themselves, “What should an ERP solution actually cost?” , “What should we expect for support and innovation?”, “When should we leave ERP providers that are underperforming?” “Why should we wait for future promises?” Thus, InFocus was born out of our desire to change the A/E industry’s perspective on what excellence means. After our initial launch in 2007, we quickly learned that many people were willing to join us in rejecting the status quo. As a result, we’ve seen consistent organic growth year over year since our inception – including 41% growth in 2018. Product Development. We have had 47 releases in the past decade. This level of development is unmatched in our industry. With innovation as one of our core values, we remain committed to improving InFocus with more API integrations and user interface enhancements. Market Awareness. Being developer owned and led means our efforts have been largely focused on developing and supporting InFocus, leading us to grow organically through referrals and word-of-mouth. We recently hired a full-time marketing manager to help us spread the word about InFocus through attendance at industry events and other various marketing channels. InFocus Adoption with Pam Ingram: Pam will draw on her 25+ years of experience in organizational leadership to teach on topics related to building buy in and user adoption around the implementation of InFocus. The first one will be January 24th. Register here. InFocus Innovation with Gerald Cox: Gerald will use his extensive knowledge of both the A/E industry and InFocus to dive into the power of the InFocus ‘engine’ and how its superior technological capabilities – like the API management layer for integrations and analytic dashboards – can drive innovation. This webinar will be ideal for technical team members and/or those that want to learn more about what’s possible with InFocus. The first one will be January 9th. Register here. We will be renaming our current learning webinar to “InFocus Applied with Lucas Hayden”; it will still be centered around mastering the basic functions of InFocus and will be ideal for all users. The next one will be January 17th. Register here. At Clearview, we are passionate about what we do. We are led by developers, not by business people or venture capital firms, which means our only vested interest is your success. Our desire has always been for our clients to feel respected and pay fairly, knowing that they don’t have to choose between performance and value. We’ve committed ourselves to listening closely to your needs and ideas, and will continue to do so. We will always listen to you, and we will always innovate and support you the best way we can. We value your feedback and we take it seriously, believing you should always feel you made the right decision by choosing InFocus. Thank you again for entrusting us with your business. We are excited about all that’s to come in the life and journey of Clearview Software and we are thankful to have such a wonderful group of people sharing it with us. Buckle up – the best is yet to come! We enjoy making InFocus a more useful tool for our customers with every release. User feedback via InFocus Ideas helps guide us and is directly responsible for many of the best features that find their way into InFocus. The InFocus 2018.1.0 release is a perfect example of this. While InFocus has always been an excellent fit for A/E firms, some of our Mechanical Engineering, Interior Design, and Landscape Architecture firms have expressed interest in managing purchase orders. 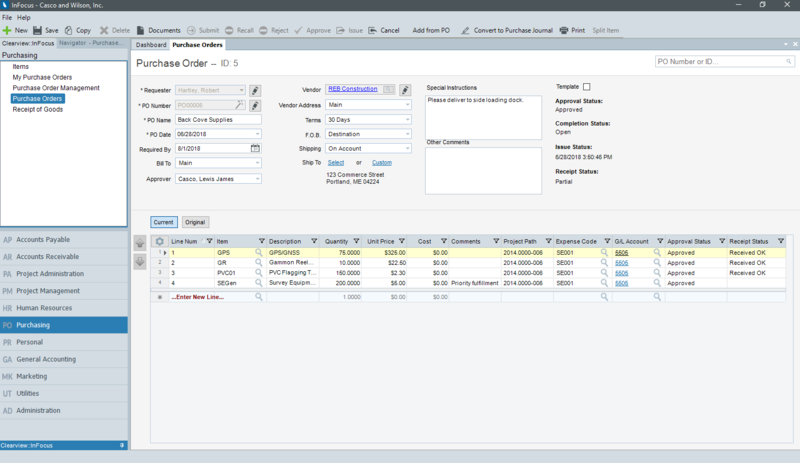 We listened, and now InFocus features a Purchasing module that supports purchase order management, comprehensive approval workflows and receipt of goods tracking. InFocus includes a new Application Programming Interface (API) and Webhook support. These tools allow firms to integrate InFocus with third-party software and services. Our developers have already created many new connectors with our favorite vendors such as Office 365, Newforma, DocuSign, Asana, BambooHR, Slack, etc. There are dozens of other improvements. We would love to tell you all about them. Give us a call or use our contact form to get more information. There are few efforts more important than cultivating your team. In a distributed team environment, you have to be creative about how you bring staff together around the ideas and goals that fuel your corporate vision. This is especially true during periods of growth. In just over a year at Clearview, our team has grown by 25%. So, when it came to planning this year’s staff retreat, we focused heavily on promoting our values and culture. We held our retreat at our main offices in Central Virginia, where about half the team is located. We place a high value on getting face time with our out-of-town staff. To promote this, we planned time for in-office collaboration as well as a couple of outside activities- including an afternoon corn-hole tournament and cookout in beautiful Bedford County. This created opportunities for employees to bond, build trust, and have fun. In addition to vision casting and department updates, we made full-staff sessions interactive and built in time for people to share kudos and appreciation for each other and the company as a whole. We know that good ideas can come from anywhere. After our retreat, we listened to feedback on various aspects of our time and will use ideas for planning in the future. 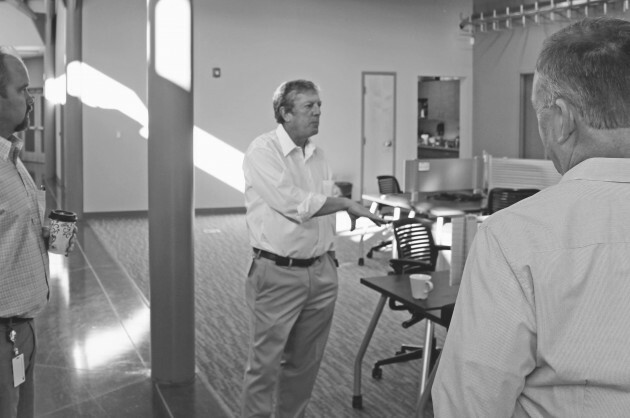 As Clearview continues to grow, we’ll be excited to share the journey. Ted Williams was one of the greatest hitters of all time. We know this because since the early days of baseball we’ve been tracking stats on every player for every game and Ted Williams rises to the top of the list in almost every category. Whether through pen and paper, spreadsheet or enterprise software we have a history of using technology to measure greatness. It’s the same for AE. Each hour on every project is an opportunity to capture and measure the great work your firm produces. Your ERP solution will either enhance or weaken that ability. But, how do you know when your ERP is falling short? Better yet, are there ways to anticipate the need for a new solution? For ERP software, there are a few sure-fire indicators that it’s time to start looking for something new. End-of-life is actually a normal stage in a product’s lifecycle- but that process can have serious ramifications. Often an end-of-life means a shift of resources away from supporting your software resulting in closed development and end of product support. Neither are good scenarios. Typically, End-of-life is preceded by a vendor buyout, final version, end of sales or the release of a new (read, “replacement”) product. On a more positive note, sometimes your firm simply outgrows the feature set of your current software. There are lots of great solutions written for small businesses to begin managing their accounting, projects or CRM. However, larger contracts call for more employees, tighter communication and fully-baked integrations. Balancing multiple vendors to capture your firm’s project/financial position can become cumbersome in periods of growth. If you’re growing too quickly for your software (congratulations!) it’s time to start looking. Running a mature ERP solution has it’s benefits. However, terms like “product maturity” can easily mask a true lack of development or product improvement. This can leave you at a disadvantage. Signs of a slow down in development include fewer and far-between improvements to the product, long standing bugs or inattentiveness to customer feedback. Since the early days of baseball, we’ve used technology to measure greatness and ERP software helps you capture this for your firm. Great ERP does that in a way that innovates, continually improves and grows with you. January 20th, 2017 is a big day. We’re not trying to steal anyone’s thunder, but we’re pretty sure the InFocus 2017.1 release should trump anything else that might be happening. InFocus 2017 brings lots of exciting new features. One that we’re particularly excited about here at Clearview is the new Analytic Dashboards. These days the ability to analyze your data for decision support has become a competitive requirement. But that’s harder to do than it sounds for a variety of reasons. So, when we first started planning Analytic Dashboards, we focused on three key goals that we felt were crucial. First, we wanted non-technical users to be able to build great analytic dashboards. That meant the designer needed to be intuitive, powerful, and baked directly into InFocus. Second, the data needed to be easily accessible. There are lots of tools out there to visualize data, but if connecting to your data is difficult, it can be a show stopper. So, we created Analytic Models. 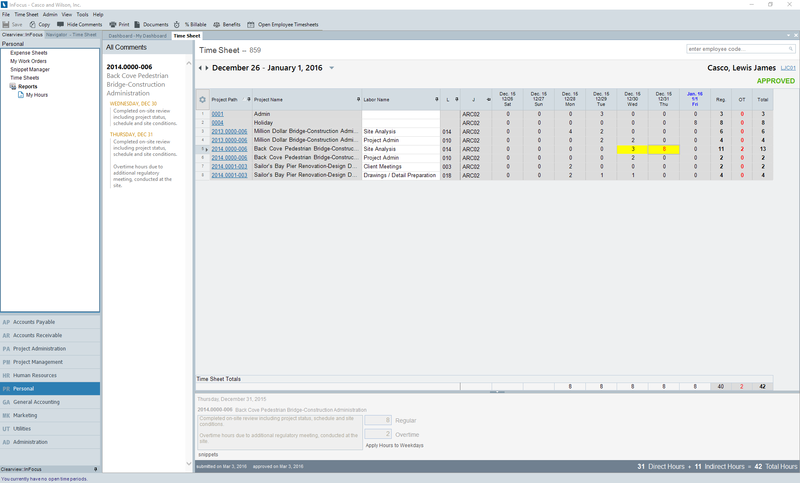 Analytic Models are “packaged” queries built specifically for InFocus Analytic Dashboards. A single Analytic Model could power scores of Analytic Dashboards. Third, it had to be affordable. If you’re in the market, you might have noticed that many other business intelligence products require more of an investment than InFocus itself. At Clearview, we pride ourselves in adding new value with every release (43 and counting over the last 10 years). If you’re a Self-Hosted Client on our Maintenance Plan or you’re on InFocus Cloud, this will all be included in the InFocus you already own. We truly appreciate your business and strive to make your investment in us pay-off continuously. We hope you will be as excited to use InFocus 2017 as we are. For a more on what you can find in InFocus 2017, be sure to check out our Release Notes or join us next Tuesday for our free webinar, InFocus 2017: What’s New. InFocus 2016 is here, bringing refined experience and performance. It also sets a foundation for infinite expandability through the upcoming InFocus Marketplace. Here are some highlights. The most frequently used applets in InFocus—time and expense—have been streamlined for easier entry and browsing. 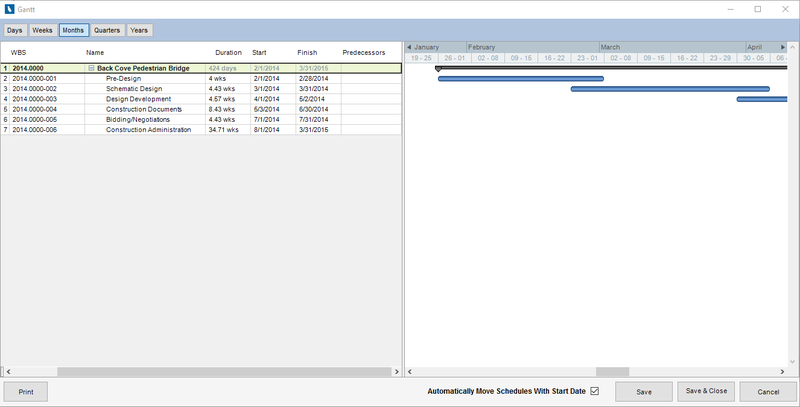 In addition to project performance improvements, InFocus 2016 introduces a new Gantt chart. It streamlines your ability to plan and order tasks, and provides feedback on the impact of scheduled items. InFocus is becoming even more powerful and easier to expand. New reports, invoices, dashboard widgets, utilities and third-party integrations will soon be a click away. 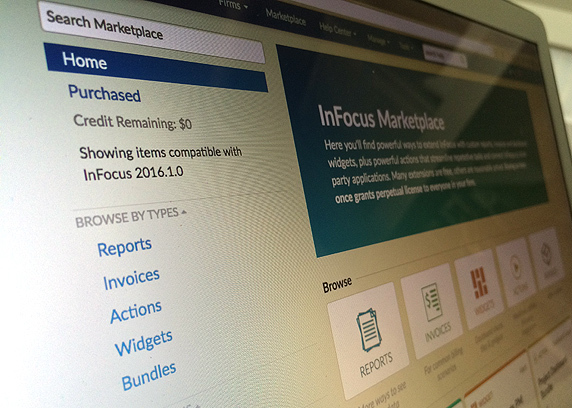 InFocus Marketplace is almost here and InFocus 2016 is already made for it. Stay tuned. InFocus 2016 is available now on InFocus Cloud and on April 22, 2016 for InFocus In-House. We hope it helps AE firms be even more profitable and productive. 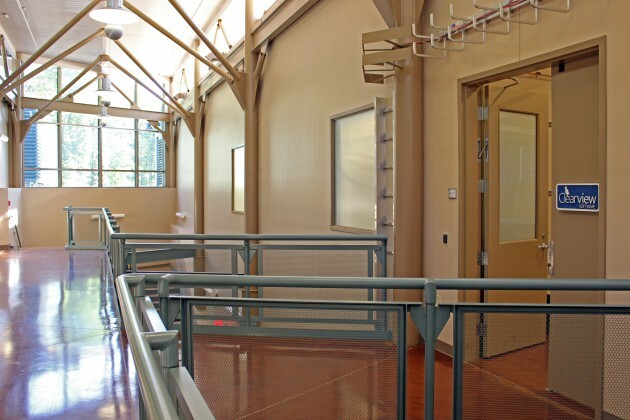 Last month Clearview moved into a spacious new facility. 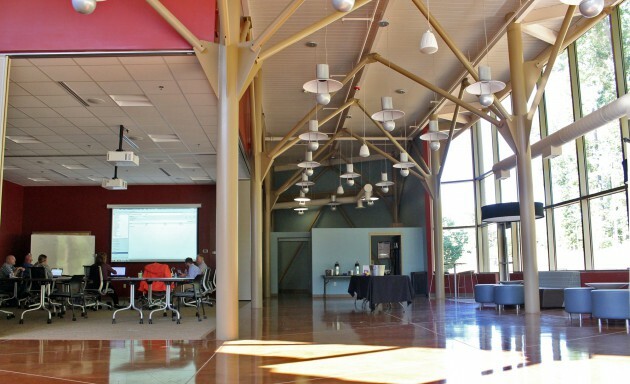 The offices are inside the Center for Advanced Engineering and Research in Bedford County, Virginia. The space lets us do things that weren’t possible before, like hosting local tech meet-ups and on-site client training. Even as this post is being written there’s a training session in progress. We’re excited about this new chapter at Clearview! As we continue to enhance the feature set and user experience of InFocus, we place great value on client feedback. In fact, many InFocus features are a direct result of the shared expertise and innovation of our user community. With this in mind, we are excited to announce the release of InFocus Ideas. Ideas is a platform for our users to join in the product discussion with Clearview developers and the InFocus community alike. Included with Clearview’s support offering, InFocus users can both sound off on their ideas for product features/enhancements and browse existing ones to vote up their favorites. InFocus Ideas launches an innovative new chapter in the development of InFocus and we’re anticipating great results. Each year PSMJ Resources, Inc. conducts their annual A/E Financial Performance Benchmark Survey. From that survey, an exclusive list of industry leaders are selected for their achievements in running productive and profitable businesses. These industry leaders are welcomed into PSMJ’s Circle of Excellence. We love to hear of our client’s success and are proud to announce that several firms running InFocus were included in this year’s Circle of Excellence! Congratulations to each member- here’s to ongoing success in 2015! Join A&E pros who get posts by email.